Dana Ewachow is too shy to order a pizza over the phone, but has no problem writing on the internet. She keeps herself busy and artistically poor by writing news articles, rants, and fiction for the internet. As you may have noticed, she also writes theatre reviews. She enjoys sketch comedies, dark comedies, light comedies, and burlesque. When she isn’t writing, her odd hobbies include: martial arts, throwing hatchets, and trying to cook food that won’t send her to the hospital. Armed with questionable diplomas and a second degree blackbelt, she will surely take over the world. The George Ignatieff Theatre looks like any other campus building, until you walk through the front doors and see the beautiful stage. 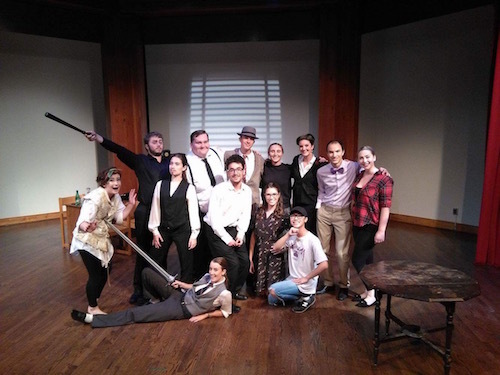 I was excited to attend the Trinity College Dramatic Society’s production of The Maltese Bodkin directed by Matthew Fonte. Yes, The Maltese Bodkin. That was not a typo. The Maltese Bodkin written by David Belke is a culture-clash of William Shakespeare and The Maltese Falcon. The Maltese Bodkin takes from Shakespeare’s entire career as a playwright, taking influence from Macbeth, Hamlet, Romeo and Juliet, A Midsummer Night’s Dream, Othello, and more. The show is set in the style of Dashiell Hammett’s novel The Maltese Falcon. Most would know it better as the noir film starring Humphrey Bogart as detective Samuel Spade. The classic is known for being full of criminals, deceit, and iconic trench coats. I was lucky to see Humber River Shakespeare’s performance of A Midsummer Night’s Dream directed by Kevin Hammond. The performance was both the first and last show to happen in Etienne Brule park by Old Mill. It was a gorgeous, clear day, perfect for an outdoor performance. I walked down the pathway along the Humber to a clearing of green grass lined with lawn chairs and blankets. People had brought entire picnics with them, snacking as the actors warmed up beside costume racks only a few feet away. I walked through the doors of the Revival Bar, feeling incredibly underdressed in a summer dress and sneakers. All around me everyone was donned to the nines, with perfectly curled hair, bold dresses, and painted red lips. I got my yellow wristband and moved through the crowd to my seat, taking in the glitz and glamour around me. I was at the opening night of this year’s Toronto Burlesque Festival. The show was called “Welcome to the Neighbourhood”, and what a welcome it was! I was lucky to attend a Toronto Burlesque Festival show all the way back in 2014. I was younger then, and had no idea what I would see. This time I knew what the Toronto Burlesque Festival was capable of, and had expectations. I am by no means a burlesque-connoisseur, but they had put the bar up so high a mere two years ago. I went to Thursday’s performance, and was not disappointed for a minute. My guest and I agreed, it was a perfect night out. 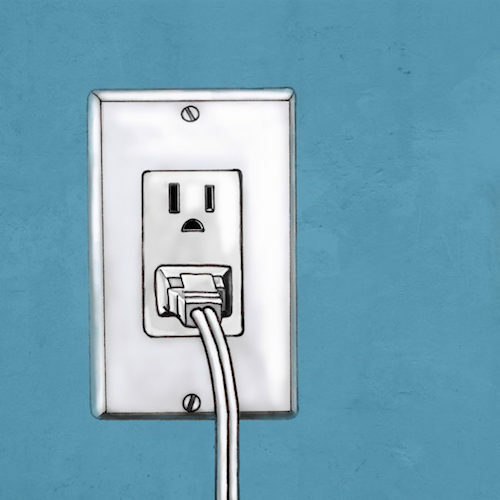 I just finished watching the show A Good Death by Cool Megs Productions at the Tarragon Theatre Extraspace for the 2016 Toronto Fringe Festival. A Good Death is a drama written by Shelley M. Hobbs and directed by Elizabeth Saunders, about two people divided by a difficult decision. A woman, Adrienne, is in a coma after being struck by a car in a hit-and-run. Her close friend Ruth and her estranged mother Margaret want to be by her side, but have different ideas on what the next step should be. 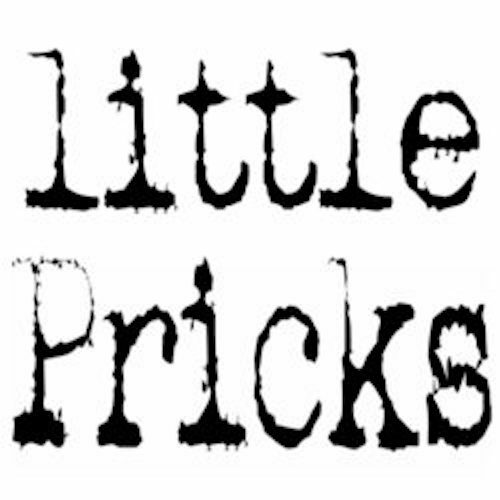 I just got back from the show Little Pricks by RUBE CO. at the Helen Gardiner Phelan Playhouse for the 2016 Toronto Fringe Festival. Little Pricks, directed by Rosanna Saracino and written/performed by Denise Norman, is about Norman’s experience with the chronic condition MS (Multiple Sclerosis). 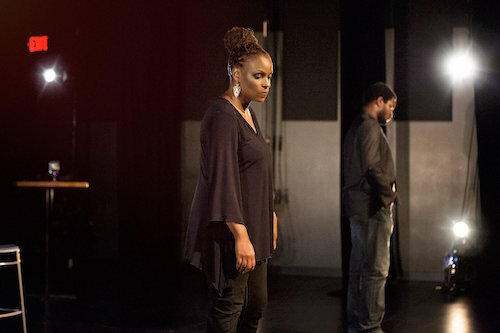 The show, dubbed an absurdist reality, was an emotional hit. I left the theatre in tears, and I know I was not the only one. Last night I was lucky to see the show The End by Please Like Me Productions at the Annex Theatre for the 2016 Toronto Fringe Festival. 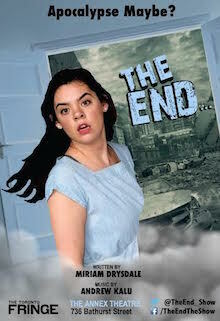 The End is a musical that takes place at the edge of the apocalypse. 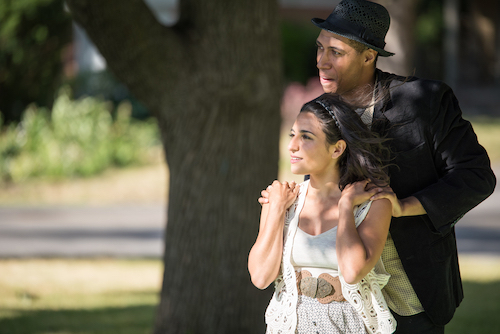 Director Heather Braaten combines tragedy and comedy, by showing two heroes can do nothing but sing into the apocalypse. 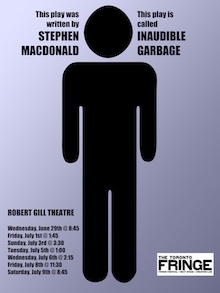 I saw the show Inaudible Garbage by Little Boy Lost productions at the Robert Gill Theatre for the 2016 Toronto Fringe Festival. Inaudible Garbage is an experimental piece directed by Stephen MacDonald, exploring ideas of theatre and solitude. It begins with a gas station bathroom, and the rest is difficult to explain. I just finished watching the show Born with a Tale by Helder Brum Productions at the Robert Gill Theatre for the 2016 Toronto Fringe Festival. 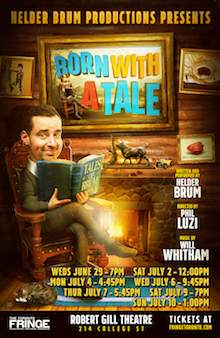 Born with a Tale is a storytelling experience, directed by Phil Luzi and hosted by comedian Helder Brum. Brum takes his audience through a series of personal tales, which I don’t want to spoil for you, because these stories need to be heard in person.